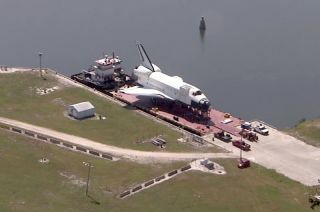 A full-size replica of the space shuttle departed NASA's Florida spaceport for the agency's Texas space center early Thursday morning (May 24), riding atop an open air barge. The high-fidelity space shuttle mockup, which was known as "Explorer" for the 18 years it was displayed at NASA's Kennedy Space Center Visitor Complex in Florida, will sail into Houston's Clear Lake on Friday, June 1. A three-day public "Shuttlebration" is planned to mark the replica's arrival, which will build up to the shuttle's delivery to Space Center Houston, the visitor center for NASA's Johnson Space Center. Once there, the mockup will be on display outdoors, where it will offer guests the opportunity to tour the shuttle, both inside and out. The replica will eventually become the star attraction of a new educational exhibition themed around the now-retired space shuttle program. In Florida, its departure cleared the way for the arrival of the real space shuttle Atlantis, which will open for display at the Kennedy Space Center Visitor Complex in the summer of 2013. The shuttle replica, which stands 122.7 feet (37.4 meters) long by 54 feet (16.5 meters) tall, was moved in December 2011 from the Florida spaceport's visitor center to the turn basin next to NASA's 52-story Vehicle Assembly Building where the real space shuttles were prepared for launch. A wheeled transporter that was used to move the mockup to the basin returned to roll the replica onto the barge. The full-size model, atop support stands, was welded down to the flat-deck barge for its ocean journey around the Florida peninsula and through the Gulf of Mexico. The shuttle replica's eight-day trip by sea will end with an afternoon arrival in Clear Lake on June 1. Greeted by a flotilla and a public street party, it will be the largest item to use the NASA Road 1 (or NASA Parkway) ramp since the stages of a Saturn V moon rocket arrived in 1977. It will take a day to offload the orbiter mockup from the barge onto a transporter in Houston before it is moved the one mile (1.6 kilometers) to Space Center Houston during an early morning parade on Sunday (June 3). The replica, which the space center is planning a contest to name, is the first of two shuttles to take to the water for its museum delivery. Soon after the high-fidelity model arrives at Space Center Houston, the space shuttle Enterprise will be loaded onto a barge in New York for its own two-day trip to the Intrepid Sea, Air & Space Museum. NASA's original prototype orbiter, Enterprise never flew in space but was used for a series of approach and landing tests in the late 1970s. It arrived in New York in late April after the space shuttle Discovery replaced it on display at the Smithsonian's National Air and Space Museum. Enterprise will first be transported up the Hudson River to Bayonne, N.J., where it will be transferred over to a crane- equipped barge to complete its trip to the Intrepid, a World War II aircraft carrier-turned-museum docked at Pier 86 in Manhattan. Once at the museum, it will be hoisted onto the flight deck and covered by a steel and fabric housing. The Intrepid plans to open its Enterprise display pavilion to the public on July 19.